Like an operating system reinstall, resetting your web browser can fix all kinds of problems and improve performance at the same time — squash annoying bugs, clear out dodgy and outdated extensions and get a browser that's good as new with a hard reset. 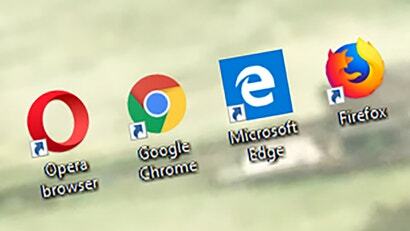 Here's how to carry it out on all the major browsers. Typically, this doesn't affect your saved bookmarks or passwords: All the information you rely on to get stuff done on the web. Some browsers let you clear all of this data as well (usually associated with a linked user account), but we'll explain where that's the case. If you're a Google Chrome user, you need to open up the Chrome menu (via the three dots icon in the top right), then choose Settings. Click Advanced to open up the second panel of options, then click Restore settings to their original defaults and Reset Settings. The startup page goes back to the default, Google becomes your search engine again, and all pinned tabs are wiped from memory. Browsing data like cookies gets wiped (though your browsing history does not), and all your extensions are disabled, though not removed. To clear out an extension properly, open up the Chrome menu again and choose More tools then Extensions. Click Remove next to any extension you want to permanently see the back of to clear it out from Chrome — just remember to save any data you want to keep from it first, if necessary. You can also clear out individual types of content from the Google Chrome browser as well: From the Settings pane you need to pick Advanced then Clear browsing data. 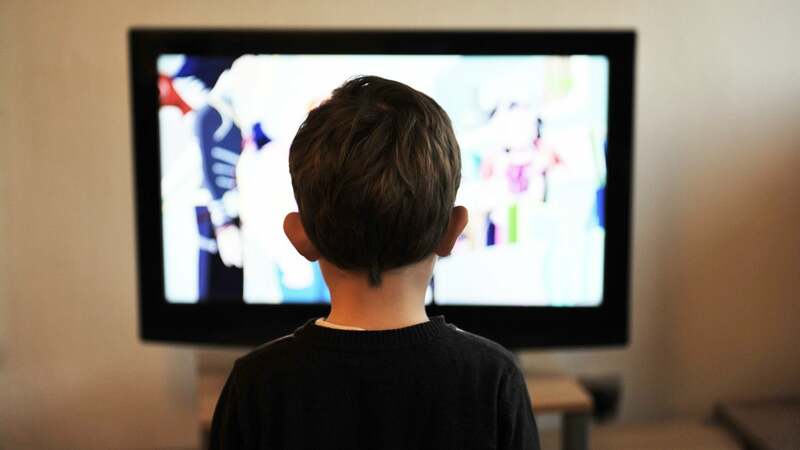 You can wipe everything from your browsing history to the file cache without affecting anything else that the browser has stored. Using Firefox? Open up the browser menu (the three horizontal lines to the top right), and choose Help and Troubleshooting Information. From the tab that opens up, pick Refresh Firefox to reset the browser. Again, your passwords and bookmarks aren't affected, and nor are your open tabs actually. All your installed add-ons and customisations are removed though, so you're effectively back to square one with the browser, but with your account data intact. It's like signing into a new install of Firefox on a new computer. 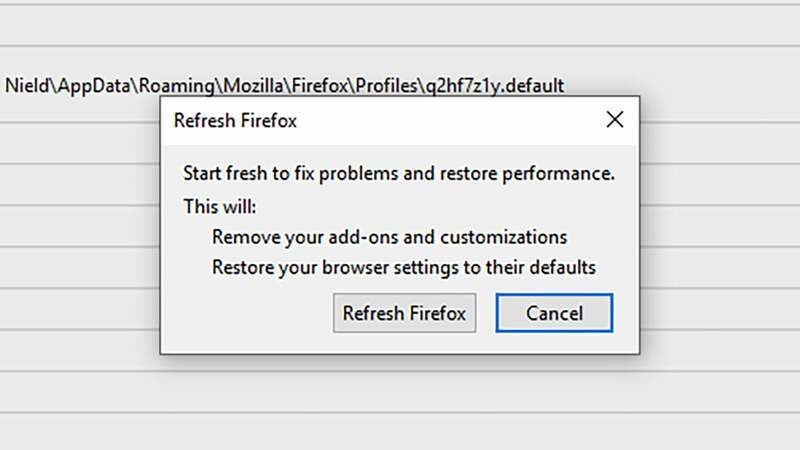 If you just want to deal with a troublesome add-on rather than resetting the browser entirely, you can find them under the Add-ons entry on the Firefox menu. Click Extensions then Remove next to any entries you want to get rid of. You'll notice there's also a Restart with Add-ons Disabled option next to the Refresh Firefox button. This puts Firefox in a "safe mode" so you can troubleshoot problems that might be caused by a bad extension — add-ons can also be removed in safe mode using the process outlined above. Unfortunately, Safari doesn't actually have a reset feature — though it did in older versions. You can either reset macOS completely, putting your entire Mac (and Safari) back to its factory state, or you can go through the individual parts of Safari to wipe them one by one. So, open the Safari menu then click Preferences — this is where all the browser options are kept. Switch to the Extensions tab, for example, and you can remove any add-ons you think are causing problems or that you just don't need anymore. 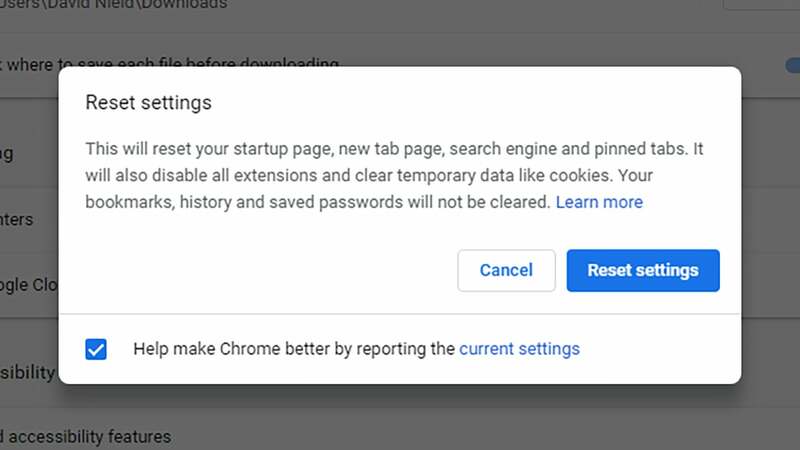 Besides extensions, browser resets usually clear out all local cookies and temporary data (so you have to log into Facebook, Gmail, and everything else again). For the cookies, head to Privacy in the Preferences dialog, click Manage Website Data, then choose Remove All on the subsequent screen. As for getting rid of the cache of temporary files stored on your computer by Safari, you need to first open the Advanced tab in Preferences, then tick Show Develop menu in menu bar, then open the aforementioned Develop menu (which has magically appeared), then pick Empty Caches. 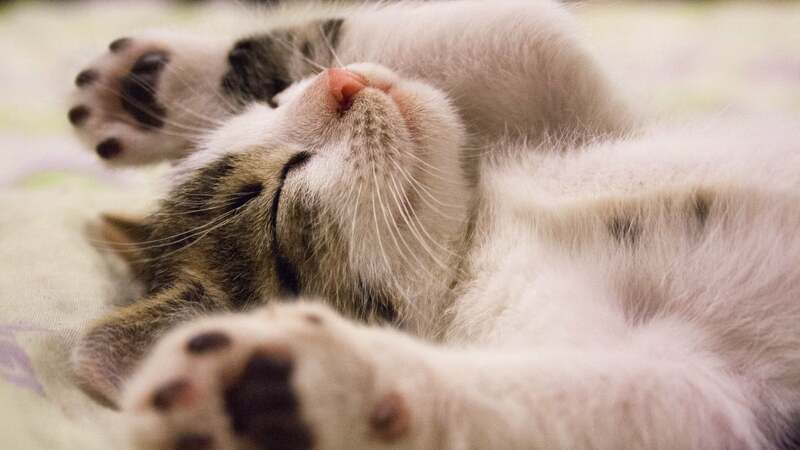 With that done, you're more or less back to where a standalone reset function would put you. 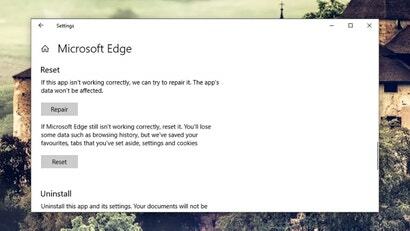 When it comes to Microsoft's new browser, again there are separate reset and repair options, but they're not actually in the browser. You need to open the Windows 10 Settings panel, then choose Apps, Microsoft Edge, and Advanced options. 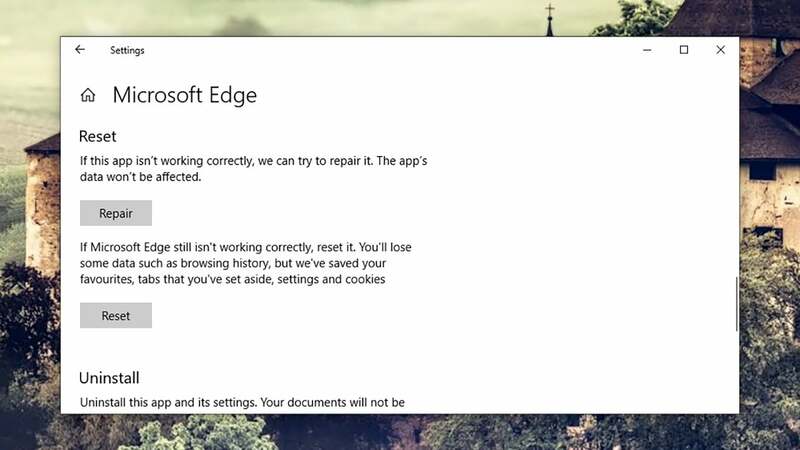 Use Repair if you can't actually start Microsoft Edge, or Reset to clear out Edge data stored on the device you're currently using — in the case of Edge, your browsing history does get wiped, and you'll be kicked out of sites you're logged into (so you have to log in again). Extensions aren't removed, but they are reset and appear as if they've just been added. As usual, you can address these various elements individually if you want to. Open the Edge browser menu (three dots, top right) and choose Extensions to see all the browser extensions you've got installed. Each one can be disabled with the relevant toggle switch, or you can click the cog icon and choose Uninstall. When it comes to browsing data and cookies, you need to choose Settings from the Edge menu, then Privacy & security, then Choose what to clear. Make your choices using the tick boxes (cookies and cached data for example), then click Clear. 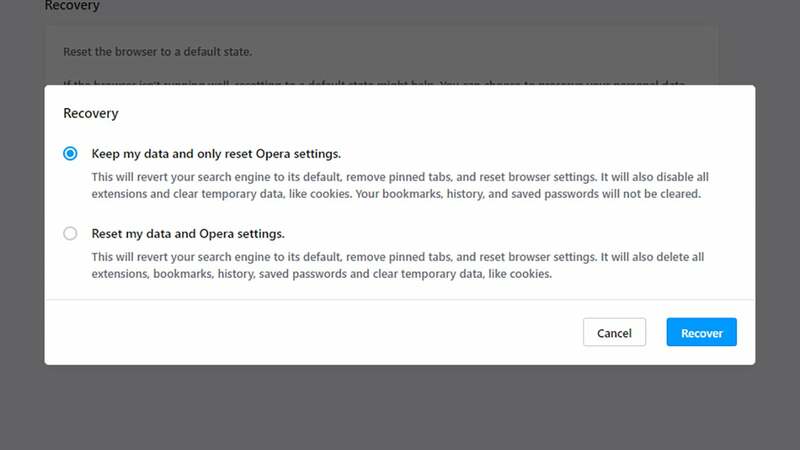 If you've got Opera installed, your reset option is actually referred to as recovery, but it does the same job — putting the browser back to its default state. You get more control over the process than some other browsers give you as well. Click the Opera button up in the top left of the browser interface, then choose Update & Recovery. Click Recover, and you can see your choices: Pinned tabs, cookies, and temporary data will all be removed, extensions will be disabled, but you can choose whether or not to preserve your bookmarks, history, and saved passwords. If you do decide to wipe everything rather than keeping your personal data, extensions get uninstalled rather than disabled. 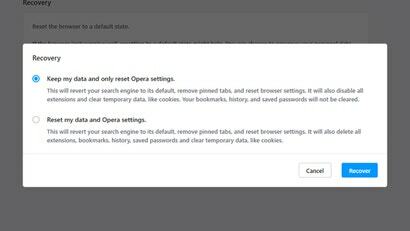 To remove extensions manually from the browser, you need to open the Opera menu then choose Extensions and Extensions. For more control over what gets deleted and what doesn't, open the Opera menu and pick Settings. Click Advanced and Clear browsing data to remove specific types of data from the browser, including your browsing history, cached files, cookies, autofill form data, and so on.